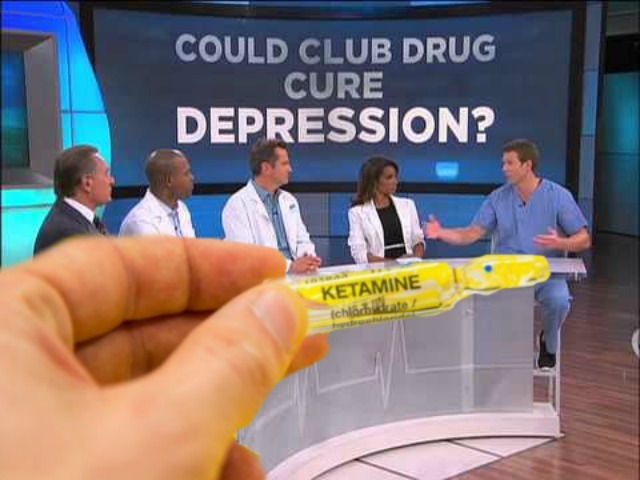 Ketamine may provide a new avenue in which depression can be treated and we applaud the scientists for at least being open to the idea. Although we should point out that when one talks about depression there are many issues at play that do not always have a pharmaceutical solution. To be clear, ketamine has a number of side-effects and we would certainly never suggest that everyone reading the article step away from the computer and k-hole. But we would, however, unequivocally suggest that the reader have the option of doing so. We encourage more study of ketamine and substances like it and we encourage readers to exercise extreme caution in taking any substances, pharmaceutical or otherwise. But we also warn that armed men in costumes smashing down doors, pointing guns at children and stomping parakeets to prevent adults from consuming substances is vastly more dangerous than ketamine or any other drug.